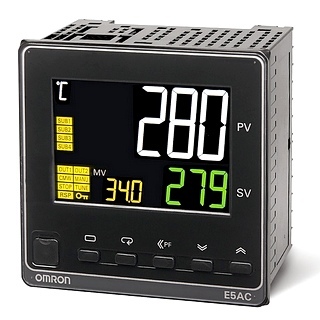 The Omron E5AC controller is one of the latest in easy to use high performance temperature controllers with a menu structure that ensures you are able to quickly and easily set-up this controller to meet your requirements. The communication port located on the front panel enables direct connection to a PC for additional programming and performance monitoring. Its high contrast LCD screen which displays characters 25mm high ensures excellent visibility in all working environments. Other models are also available within this range. View more details of the Omron E5AC - 1/4 DIN Temperature Controller range. Other models might not be available from stock, please contact us for price and lead time.